Note: This review contains minor spoilers, although nothing that can’t be gleaned from watching the trailers. Star Trek Beyond is a Star Trek movie, although not an especially good one. Although that description might sound self-evident, there was concern within the Star Trek fan base that the selection of Justin “Fast and Furious” Lin might move Beyond too far from its roots. Without a doubt, Lin has changed things - the movie’s look is radically different, with an abundant use of shaky-cam shots and dizzying quick edits. The action sequences are frenetic, kinetic, and at times incoherent. This isn’t unexpected; it’s Lin’s trademark. But the plot, credited to Simon Pegg & Doug Jung, is pure Trek. Unfortunately, it’s also instantly forgettable. Lin’s mandate, one assumes, was to continue J.J. Abrams’ mission to make Star Trek mainstream. Although Abrams’ Trek may have been influenced by Star Wars, Lin draws more from Guardians of the Galaxy. Pegg and Jung’s screenplay, which amps up the humor considerably from the tonally glum Star Trek Into Darkness, is complicit in this. No previous Star Trek movie has boasted visual effects this special - the craft evident in creating the Yorktown Starbase takes the movie where no Trek movie has gone before. The devastating attack on the Enterprise is impressive, although the ship took almost as bad a bad pummeling in Star Trek Into Darkness. Its final fate echoes The Search for Spock and Generations, although without much of an emotional impact. This Enterprise has always felt more like a prop than a character. It hasn’t been around long enough to win our affection. Pegg & Jung’s script, which picks up three years into the five-year mission, seems designed more as a means for getting action and character vignettes on screen than providing viewers with a compelling narrative. It can be summed up succinctly as: Big Bad Guy with alien prosthetics destroys the Enterprise as step #1 in an attack against the Federation and it’s up to Kirk & co. to stop him before he launches the final assault. Subplots involve Kirk (Chris Pine) wondering whether he wants to continue as a starship captain, Spock (Zachary Quinto) pondering going to new Vulcan and helping to repopulate the species, and McCoy (Karl Urban) providing comic relief. 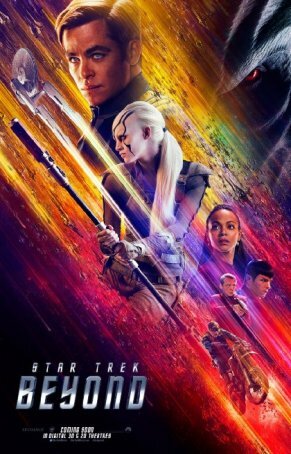 Unsurprisingly, Scotty (Pegg) has more screen time than in the previous movies, showing his miracle worker abilities and bonding with a black-and-white warrior woman alien, Jaylah (Sofia Boutella). Sulu (John Cho), Uhura (Zoe Saldana), and Chekov (the late Anton Yelchin) are given more to do than in either 2009’s Star Trek or its first follow-up but they’re still mostly in the background. The Star Trek movies have a history of using strong actors as villains. The Wrath of Khan established the template with Ricardo Montalban. Christopher Plummer came on board for The Undiscovered Country. Malcolm McDowell, F. Murray Abraham, and Tom Hardy followed. Abrams used Eric Bana and Benedict Cumberbatch. Now Idris Elba has joined the Star Trek family. Unfortunately, buried under all the prosthetics, he might as well be some extra pulled off the street. This is an unforgivable underuse of talent. Krall is a weak villain with an underwhelming motivation. The build-up to revelations about his past, one of the movie’s hooks, doesn’t have a satisfying payoff. Members of the “new” crew, who have now been involved in the series for three movies over seven years, are still growing into their roles. The camaraderie in the Kirk/Spock/McCoy trio is more natural in Beyond than in either Star Trek or Into Darkness and, for the first time, Pegg doesn’t seem horribly miscast as Scotty. Saldana’s Uhura remains a beacon of class and strength but I’m not sold on either Cho or Yelchin. Long-time Trek fans can be excused if they still see these second-generation replacements as imposters. In an era when none other than J.J. Abrams (with The Force Awakens) showcased the enduring power of nostalgia, it’s odd that no attempt was made to involve any of the surviving original Star Trek actors in this production. Perhaps the best moment in Beyond involves a short but moving tribute to the seven original actors. The strength of that moment (and the way the playing of the original theme continues to elevate the emotional pulse) hints at missed opportunities. Skyfall gave Bond fans a fitting 50th anniversary celebration; it’s too bad that Beyond doesn’t replicate the experience for Star Trek loyalists. Then again, the cinematic landscape has changed. Original fans are grandparents, many in their late 60s and 70s (not in their 30s as when The Motion Picture opened). Except in isolated pockets, the passion isn’t there anymore. That, more than anything, is the reason why today’s Star Trek has become plot-light and spectacle-heavy. Star Trek Beyond can stand toe-to-toe with any of 2016’s big-budget blockbusters. When it comes to visual razzle-dazzle and directorial chicanery, it has nothing to be ashamed of. But, as is often the case, those things mask deficiencies in the story. Forgive me for wondering exactly where “beyond” is taking us and whether, ultimately, the trek will be worth it.